Here's some more Westside action! These photos were taken at various places around Ipswich. I will post a link to my YouTube video of the photos and some bonus footage included. It will be called "VLOG 9: Bus Spotting Around Ipswich". The channel is called Sydney Buses CB60. Please like and subscribe as it would help! Thanks. Anyway, stick around because I've got lots more to post - Including a POSSIBLE sighting of a (Ex) Brisbane Transport Austral Bodied Volvo B10M, although I didn't get a photo but please refrain from being Einstein here as I DO KNOW THEY WERE (APPARENTLY) ALL WITHDRAWN BACK IN 2015. Anyway, I will expand on this subject in another topic. Please note that I was UNABLE TO GET A PHOTO. Back to Westside, enjoy the photos! 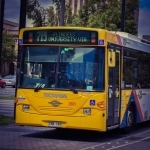 Westside #83, a Volvo B12BLE with Bustech VST bodywork arrives into Bell Street Stop C while performing a route 515 to Yamanto. Westside #21, another Volvo B7RLE with Volgren CR228L bodywork terminates at Bell Street Stop B. A Westside Volvo B7RLE with Volgren CR228L bodywork preparing to depart Ipswich Bell Street on a route 515 to Brassall. Looking forward to seeing the rest and will check YouTube when I get home. Westside #93, a Scania K280UB with NCBC Gemilang bodywork arrives into Bell Street Stop C.
Westside #38, a Scania K230UB with Bustech VST bodywork departs Bell Street Stop C on a route 503 to Bundamba. A Westside Scania K280UB with NCBC Gemilang bodywork arrives into Bell Street on a route 512. Interesting look that bus with the NCBC Gemilang bodywork has, but nice pics overall. Looking forward to seeing some of your videos and your future posts!